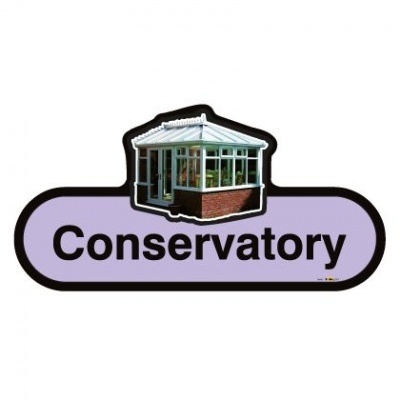 Specifically designed for dementia, the Find Signage Dementia Conservatory Sign uses large, clear lettering to aid readability and is available for a range of care environments. It can be difficult for individuals with dementia to read standard signage and in unfamiliar environments like new care homes this can cause significant stress and anxiety. Because of this, it's vital you do everything you can to help those under your care find their way throughout your facility. 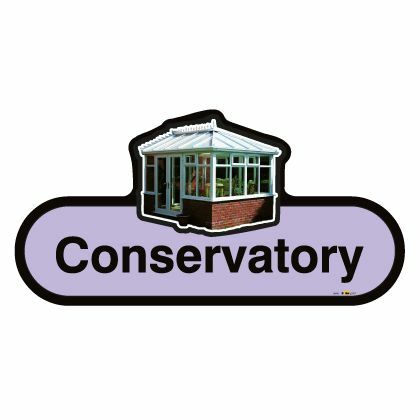 The Find Signage Dementia Conservatory Sign has been specifically designed to help those with dementia more easily find the conservatory in your facility, helping to reduce your residents' levels of stress and anxiety. The sign specifically helps those with cognitive impairments find the conservatory by targeting key factors that typically influence those with dementia. It provides multi-sensory recognition to residents – touch, pictorial and colour – giving them a clear idea of what the sign is for. The stress and anxiety that getting lost in an unfamiliar environment can cause in those with dementia can make what is meant to feel like their new home instead feel like a labyrinth with no exit. This clear and easy to locate sign helps you give those under your care a clear indication as to what the room is, reducing the anxiety a new environment can cause. Standard signs have been designed for care home use and feature a durable construction for demanding environments, as well as a hidden integrated wall fitting to reduce risk of vandalism. Hygenus signs, made from materials that meet infection control standards, are great for use in hospitals. Self-adhesive signs are good for low-traffic areas, and because they would likely damage decor if removed, they are also suitable for use in an individual's own home where permanent signage may be needed. Please note that self-adhesive signs are only available in size Small.